D.C. - The Big Show! Come See Me At The 2018 DC Pen Show! It's that time of year again! From Thursday, August 2 through Sunday, August 5, I'll be attending the Washington, D.C. Fountain Pen Supershow at the Marriott Fairview Park. This year, I'll be at the Vanness Pens table, so stop by and say hello if you get the chance. Vanness will be bringing their wall of ink, pens, paper & more! Note that Thursday and Friday at the show are "Trader Days," meaning that you will have to purchase a weekend pass to attend ($45). The weekend pass also gets you into the show an hour earlier on Saturday and Sunday. I highly recommend attending on Friday and early in the mornings on the weekend - it's much less crowded, and you'll have first crack at rare pens and inks. Stuff can sell out fast! The show opens to the public on Saturday morning, and single-day admission is $9. Just one of the Vanness Ink displays that they will have at the DC Pen Show. Disclaimer: Vanness Pens is a sponsor of this blog, and I will be working for them at the show. 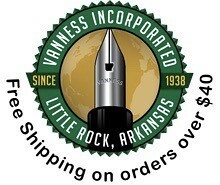 For more about Vanness, see my post talking about my visit to their store in Little Rock, Arkansas earlier this year. Three pens I've had inked up this week, from left: Faggionato Petrarque, Conway Stewart 100, and Montblanc for UNICEF Classique Doue. Platinum 3776 Century Kumpoo (via Fountain Pen Follies). This pen seems to be selling out VERY quickly. If anyone has their eye on it, now would be the time. Plus all the reviews I've read have been positive. Karas Pen Co. Reaktor: Galaxie and Starliner XL (via Nib & Ink). Matthew checks out the Galaxie and Starliner pens from Karas Pen Co., with a very thorough review of both. Pelikan Edelstein Olivine Review (via The Looped Square). A great review of Pelikan's latest Ink of the Year, which we'll all likely see at the upcoming Pelikan Hubs. I had forgotten that this year's ink was chosen via community submission. I Hate the Rotring Newton (via UK Fountain Pens). The Newton isn't one that I'm familiar with. Nor is it one that I think I'd like. Japanese Stationery Guide: Why Everyone Loves It and Which Brands to Try (via Milligram). Australian retailer Milligram published this guide to some of the major Japanese stationery companies. Inventery Pocket Fountain Pen and Rollerball + Giveaway! 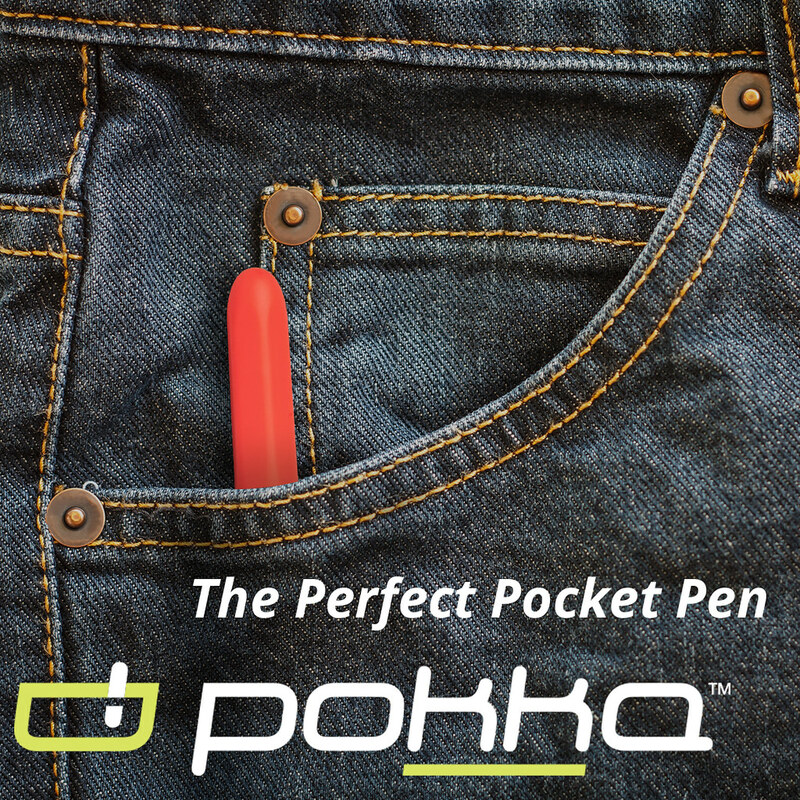 (via Pens! Paper! Pencils!). Ian reviews the Inventery Pocket Fountain Pen, which still continues to receive good reviews. He's also giving this one away, so check out the giveaway terms. Field Notes "Three Missions": Crew Capsule Models (via Three Staples). Ginny takes a look at the "extras" from this quarter's Field Notes limited edition - paper models of the Mercury, Gemini, and Apollo crew capsules. Nakaya Pen Clinic - 2018 (via Alt.Haven). Junee attended Aesthetic Bay's Nakaya pen clinic in Singapore, with pictures! Aesthetic Bay Nakaya Clinic: Day 1 (via Hand Over That Pen). Katherine also had a chance to visit the Nakaya pen clinic. More pictures! Platinum 3776 Century Nice Lavande Fountain Pen Review (via Ed Jelley). Ed's new contributor Sandra reviews the Platinum 3776 Nice Lavande. If you're a fan of purple pens, make sure you check this one out. Vanness Pens. Vanness Pens carries rare and hard-to-find inks from all over the world, including Callifolio, Akkerman, and the full line of DeAtramentis. Be sure to check out the 80th Anniversary collaboration between Vanness and Bexley Pens, featuring a custom material made by Jonathan Brooks. You can check out my recap of a visit to Vanness here. This week on the blog I looked at inks, including three Montblanc Special Editions (Antoine de Saint-Exupery, Beatles "Psychedelic Purple", and UNICEF Blue) and Albert/V2 Rocket, two of the new Colorverse Season 4 Inks. Also, don't miss this week's Deals & Drops, with new Baron Fig pencils and more! Colorverse Albert in my Franklin-Christoph Model 02 with a Masuyama-Rouse 14k needlepoint nib. Colorverse V2 Rocket in my Jim Rouse Sheaffer Legacy. Colorverse inks continue to pleasantly surprise me. With all the crazy colors, sheen, and "glistening" properties, one might think that these inks would be slow to dry, or otherwise have issues with feathering and bleeding. Not so - every single one of these inks has behaved itself in any pen I've tried, and Albert/V2 Rocket are no exception. You can check out my prior reviews of other Colorverse inks, including Black Hole and Dark Energy, Schrodinger and Cat, and Quasar. Many thanks to our sponsor Pen Chalet for graciously supplying this set of Colorverse Ink for review. Pen Chalet carries the entire range of Colorverse, including Season 4. Each set is priced at $36 USD for 80ml of ink (a large 65ml bottle and a smaller 15ml bottle), and with this season you get two different inks per box, much like Season 3. 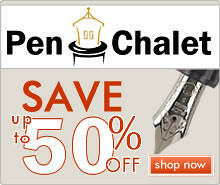 Disclaimer: Pen Chalet provided me with the ink featured in this review free of charge. This post contains affiliate links. Deals & Drops: Catching up on Special Editions and New Releases, Plus a Baron Fig Archer! If you've had your eye on one of this year's Aurora 88 Special Editions like the "Marte" or "Urano," they're starting to get scarce. Also, don't miss your chance to check out the new collaboration between Baron Fig and Caroline Weaver, the "Elements" Archer pencil! I also have a handful of other new or past limited/special editions for you to consider. Happy shopping! Baron Fig + Caroline Weaver "Elements" Pencils (via Baron Fig). You know, I was just wondering the other day whether or not Baron Fig would be releasing more limited edition Archer pencils, since it's been a while since the last one. Then this hit my inbox. And it's the best one yet. 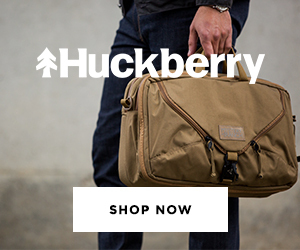 Use my referral link to get $10 off orders of $20 or more. Aurora 88 Marte Limited Edition (via Pen Chalet). Pen Chalet has some of the red and rose gold Marte editions left in stock. These will likely sell out in the near future. Aurora 88 Urano Limited Edition (via Pen Chalet). Very few of these made it to the U.S., so if you have your eye on one, act quickly. Colorverse Tokyo 2018 Hayabusa Special Edition Ink (via Pen Chalet). Colorverse has released a new ink for this year's Tokyo Stationery Show! Also, don't miss the new inks from Colorverse Season 4, which just hit stores. New Nemosine Demonstrators (via Pen Chalet). Nemosine just released two new versions of the Singularity fountain pen demonstrator in Obsidian and Rose Gold. Conway Stewart Fountain Pens (via Vanness). 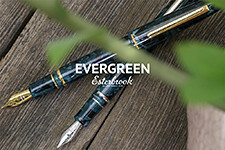 Vanness has Conway Stewart fountain pens back in stock, in all of the unique acrylics that Conway Stewart is known for. You can check out photos of my Series 100 in Honey Noire here. Montblanc Heritage Spider Coral Metamorphosis Fountain Pen (via Appelboom). Montblanc released an updated version of the Coral Heritage fountain pen, with new "spider" trim. Retro 51 Tornado Terabyte 2.0 (via Anderson Pens). 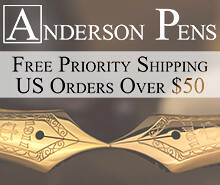 Anderson Pens released the follow-up to their "Terabyte" fountain pen, which features black trim. Bellroy Classic Pouch (via Amazon). This Bellroy pouch has become one of my favorite everyday carry items, which I use to cart around cords, headphones, document flags, pens, pencil sharpeners, etc. Highly recommended. Bellroy A5 Work Folio (via Amazon). Expensive, but well-made. A great accessory for the office. 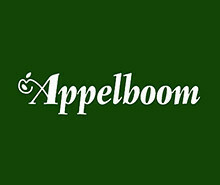 Check out my review of the A5 Folio here. Cross Special Edition Pens (via Goldspot). 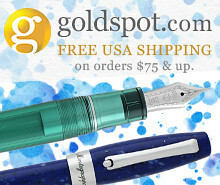 Goldspot is featuring a weekly sale on Cross special edition fountain pens, rollerballs, and ballpoints. Pelikan M600 Turquoise Special Edition (via Amazon). The turquoise M600 was a huge hit and is starting to sell out. There are still a few around on Amazon, etc. Pelikan Polar Lights Fountain Pen (via Amazon). I haven't seen one of these in a while! The Polar lights was a special edition from a while back. Pilot Capless Fountain Pen in Yellow with Satin Black Trim (via Pauls Paper & Pens). I ordered this yellow Pilot Vanishing Point from Paul earlier this year.